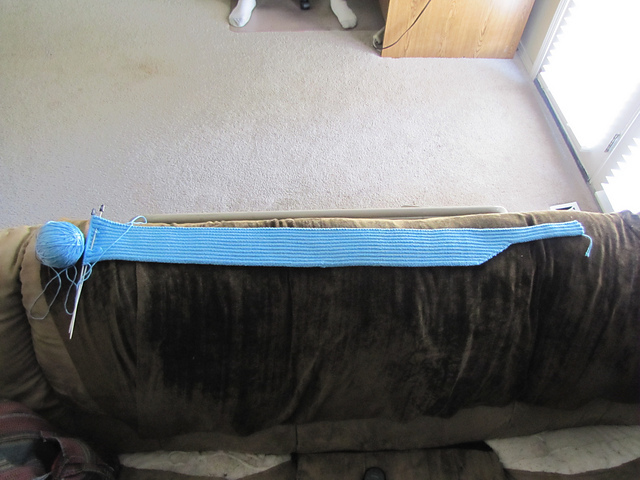 So, I've recently started knitting Rinoa Heartilly's long blue duster from Final fantasy VIII. I have a Ravelry.com account which is a site for knitting and crochet projects, but I've been treating it like a progress blog with frequent updates. then it occured to me, I have a blog. I ought to do it there. So I'm now going to make a large post bringing you up to date and we'll go from there. 11-11-11 bought the yarn. here goes nothing. I’ve made a few test runs for the shape, and taught my friend Marissa how to rib knit so she can help me with the long expanses of tedious tiny knitting. can’t wait. 12/1/11 well, after many debates I’ve changed the color of the yarn. the aqua was just too dark. the sky is maybe a bit light, but it’s more accurate. however, I have several christmas projects I’m working on at the moment, so it’s gonna be a bit before I actually get this cast on. I posted this on a dozen forums, and my facebook just to get opinions. My family said French Blue, and the foruns said Aquamarine. Don't like the aquamarine. it's really pretty, if I have a spare $50 I'd just keep it and use it for something else, but I don't. 1/2/12 SO CLOSE to casting on. Lolz. I have a scarf I’m making for my brother, and as soon as I finish that I’m starting this. On the bright side, due to various Christmas gifts, I have the rest of Rinoa’s outfit almost completely done. I’m just redoing the shorts entirely (for the third time) and the color of the denim for her skirt may finally be right after this current round of dye. I have the boots, and Marissa bought me a replica of her necklace for Christmas. I used our Christmas tradition of new Christmas jammies every year as an excuse to get a black v neck tank. 1/24/12 actually doing it now! I swatched a teeny tiny bit to get gauge and to throw it in the wash to monitor it’s behavior. everything seems fine. I am currently doing something in the nature of a test run for shaping based on the notes for the previous test run I did on random bits of yarn. this is knitting from the top of the shoulder strap down. co 16 sts, k2 p2 across the row, back and forth for about 6”. after that I start increases for the body. gonna mess with that a bit and then I’ll put up what I did. depending on how this turns out it may be my actual piece, or I may restart. once I get it to it’s final width that it will be for the rest of the length, I’m gonna get it wet and hang it up to see how bad the stretching is. I need to know how to accommodate that. in an ankle length duster I can’t have it stretching to the ground. not okay. incidentally, when I’m done I will clean it up and try to create an actual pattern here. 3/1/12 well, progress ground to a halt. I am having a heck of a time trying to finish my husband’s socks, and I won’t work on anything else until they’re done, or they’ll never get done. so this is waiting. in the meantime, I thought I’d put up my notes and plans. She has great info for both sewing and knitting, and that was the basis for my plans. she also has a fantastic pattern for the shape of the duster if you were able to just buy fabric and you’re not knitting it yourself. I am using sport weight yarn, Sky color, ordered online from knitpicks.com, and size 2 (2.75 mm) needles. The fabric for Rinoa is a 2x2 rib knit, so I’m doing knit 2 purl 2 pattern. It’s being done in two front panels and one back panel and I will seam them together when done. Based on close studying of her pictures and my own measurements, I figure the straps should be about 4-5 ribs wide, about 2” wide. 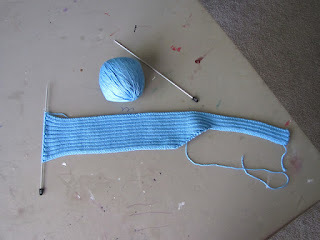 While knitting, my plan is to purl front and back the last two stitches at the end of a row (or knit front and back, if the row ends on a knit stitch), do next row without increases, then same increases next row, and so on, alternating, making sure increases are always on the same site of the piece. that creates a curving increase on one side while leaving the other side straight. 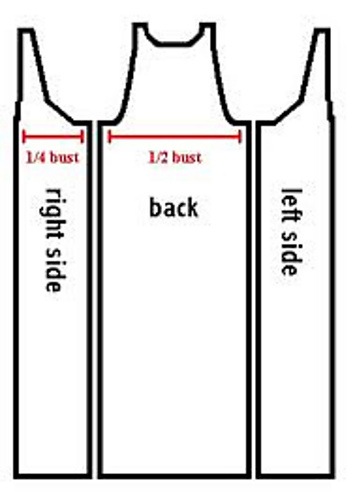 the straight side is what goes down the front. I figured you would knit the straps about 6” before starting the increases for the body. I did do a test run with larger needles and yarn to practice, but I don’t know if it will work the same with the smaller needles and yarn. I worked the increases for about 6 1/2” on the practice run. the back panel appears to be about 27 ribs wide at the widest part, decreasing to about 15 or so at the top for shaping. I haven’t worked out exactly how I’m doing that yet. IMPORTANT: ALL THESE NUMBERS ARE SUBJECT TO CHANGE BASED ON MEASUREMENTS AS I GO ALONG. I HAVE NOT DONE THIS WITH MY ACTUAL YARN AND NEEDLES. THESE ARE ONLY PLANS. I will post official numbers once I’m done. The armwarmers I’m just planning to knit a tube on double pointed needles, same 2x2 rib knit. basically for that I’m just going to measure my arms and figure out the number of stitches based on my gauge. 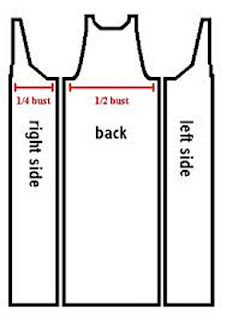 Make sure to make it a little smaller than measurements to make sure of a snug fit, and to hopefully avoid issues with slipping. I did buy some thin elastic in case I need to tighten the ends to keep them from slipping. Gauge with the sport yarn and size 2 needles in stockinette is 7 sts per inch, 10 rows per inch. leradny bought 13 skeins of yarn, with 138 yards per skein. I bought 18 at 110 yards per skein. I probably way overkilled, as leradny said on her ravelry.com account that she only used 10.5 skeins of yarn for hers. but I’m much taller than her, and paranoid about running out, especially since I had to order this online. and those are all my notes. I’m perfectly willing to help anyone out if you need it, feel free to message me or comment. I will update as I actually put these plans into action. 7/17/12 (FIRST UPDATE IN AGES) Well, kinda took a vacation from all yarn crafts. Unfortunately, I’ve seen this happen with me before. I go in stages. And when something like Caleb’s socks comes up where I’m forcing myself to do it, it burns me out for a bit. But I’m finally coming back. started working on this again. I’ve finished the shaping of the first front panel, and now I’m to the tedious bit of knitting straight down until it reaches my feet. 8/7/12 used up my first skein yesterday. looking at it, I’m guessing that means it’ll take about three or three and a half skeins for each front panel. maybe double that for the back. I’m gonna guess 14 total for the thing. that’s being generous I think. plenty for the armwarmers. 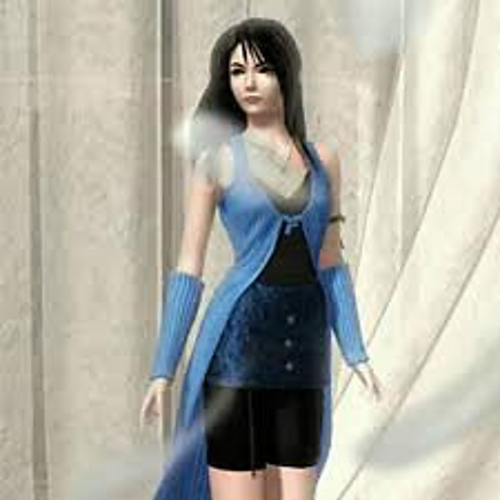 I’m hoping to have enough left for a little shrug I want to make based on some fanart of Rinoa, a new take on her oufit I really like, but I don’t know if I’ll have enough. ah well. I can always get more if I need it. 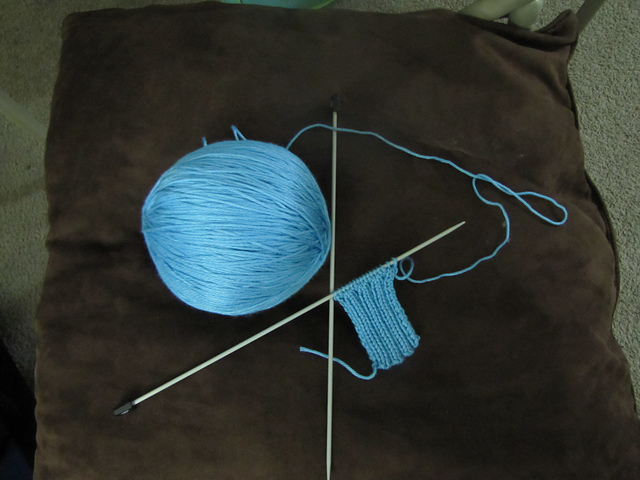 Did a Russian join for this first skein to try to avoid millions of ends to tuck in, but it made a bit of a bump. it’s not terrible, and it’s on the edge of what will be the side seam so it won’t show, but there’s no guarantee that’ll be the case for all of them. so I’m gonna try a braided join next. that seems smoother. 8/11/12 finished the second skein on Friday, and the piece is about knee length. so it’s actually gonna be less than three skeins for this, because a full third skein would hit the floor. just a bit too long. but I’m making good progress now. did a braided join this time and it’s much smoother. I can still feel the bump, but you can’t really see it.